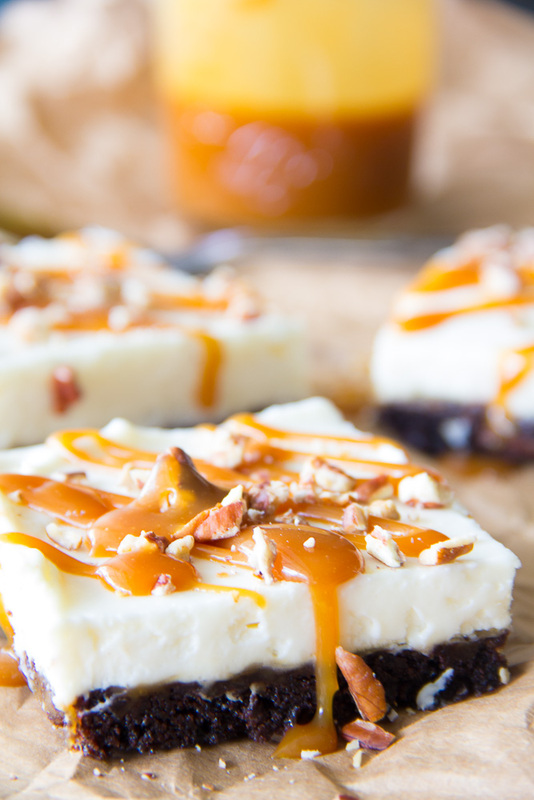 A decadent dark chocolate brownie layered with a creamy, no-bake cheesecake is drizzled with a dreamy homemade salted caramel sauce. If you’ve been following me, you’ll recall that I got to attend BlogHer Food in Chicago last month. Not only did I get to meet the lovely, Ree Drummond of Pioneer Woman, I also got to meet the talented Jocelyn Delk Adams of Grandbaby Cakes. She was representing Bailey’s Coffee Creamers and they were featuring her delicious Cookie Cheesecake Swirl Bars and boy were they ever tasty! I must have had 6 or 10 of them during the conference. I lost count as I pretended to be a new visitor at each sampling. 🙂 They were just that great! Make the salted caramel - Pour sugar in a medium saucepan over medium-high heat. Whisk until the sugar has completely melted. Allow the sugar to get nice and bubbly brown. As soon as your sugar turns that beautiful deep amber caramel color, add the butter and whisk until your butter has melted. Whisk until all of the half and half has been combined. Add the sea salt and stir. Make the brownies - Preheat oven to 325 degrees. Spray 2, 8x8" baking pans with non-stick baking spray. Blend water, oil and egg in medium bowl. Add mix and stir until moistened. Spoon batter evenly into prepared pans. Bake for 15 minutes. Cool to room temperature. Make the cheesecake - Pour heavy cream into a stand mixer and mix on high speed until heavy peaks develop. Store thickened cream in a separate bowl in the refrigerator. Add cream cheese to stand mixer and mix on medium high speed. Add sugar and creamer to bowl and mix until well blended. Scraping down the sides of the bowl. Add vanilla and mix until combined. Fold thickened cream into cream cheese mixture. 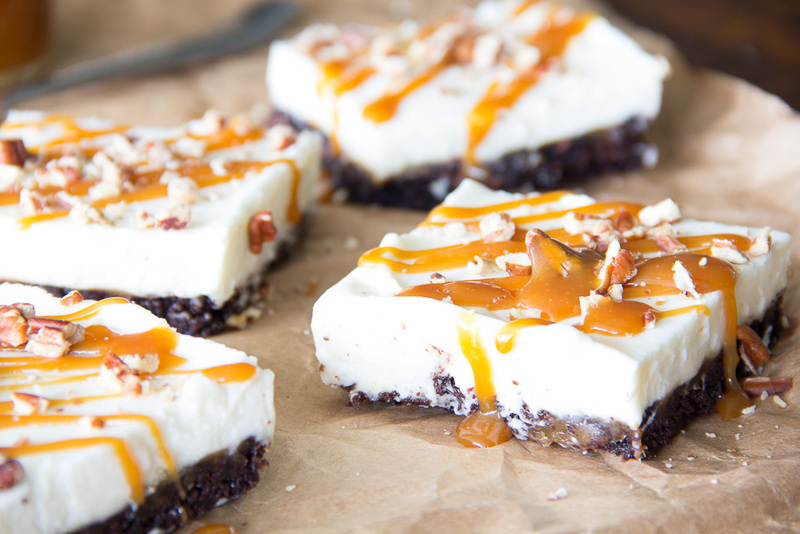 Evenly spread ½ c. of salted caramel on both cooled brownies. Pour half of cheesecake filling over each brownie pan and spread until even. 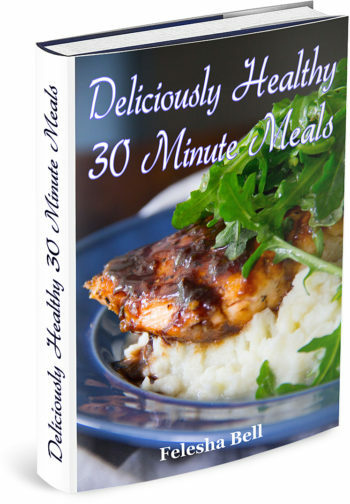 Freeze for at least 4 hours. Cut into 3 rows horizontally and vertically to create 9 bars then refrigerate. 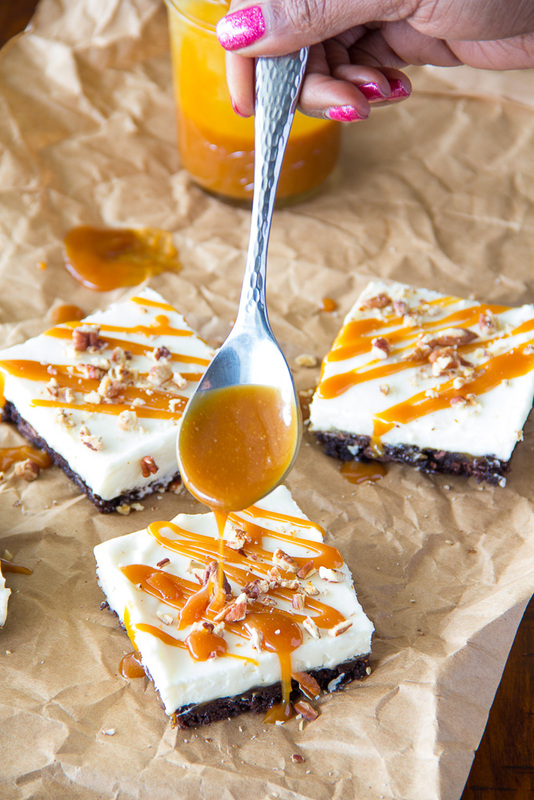 When ready to serve, drizzle with caramel sauce and toasted pecans. Say Grace and enjoy! It looks like you found the way to my heart ❤ what a gorgeous cheesecake bar! Those bars look amazing! I made some similar ones but I’m behind in posting. You’re so lucky you had the chance to meet those two ladies. They are my favorite bloggers! I know right?!?! They’re both amazing! Thanks for stopping by April! 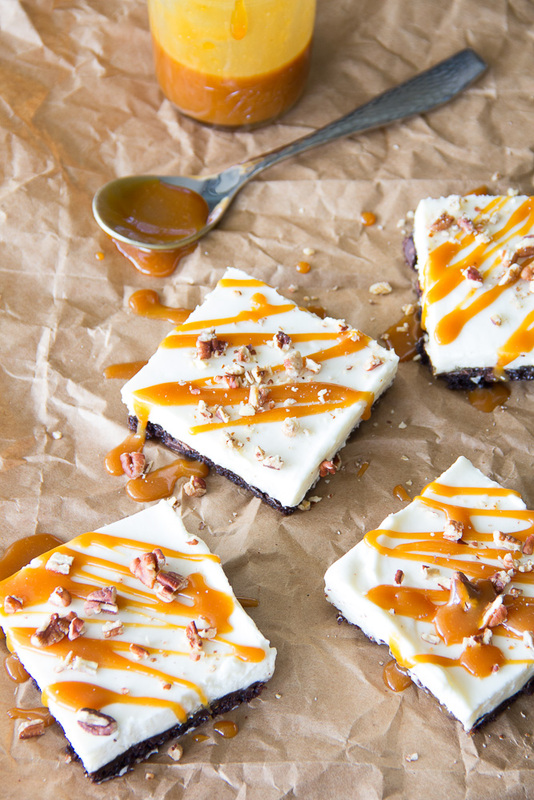 I am a huge fan of salted caramel and these brownies sound utterly, fantastically divine! I need these in my life! Thanks Elizabeth! These are definitely a family favorite! I know, right?!?!? A caramel pool?!?!? 🙂 Thanks Kathryn! Oh my these look delicious – I know Ghiradelli brownie mix tastes wonderful and the additions look superb. Am ever so slightly envious that you got to meet The Pioneer Woman too! I always find you get a better result when you use better quality ingredients like the Ghirardelli product. That caramel looks very tempting too! Thanks Revathi! Yep! Salted Caramel is soooo bomb!! Thanks for stopping by! Thanks Farhana! Be sure to let me know what you think!